When you buy a system, ask yourself – what matters most to you? Is it all-out peak performance? Is it performance per watt? I can guarantee that out of the AnandTech audience, we will have some readers in each of these categories. Some will be price sensitive, while others will not. Some will be performance sensitive, others will be power (or noise) sensitive. 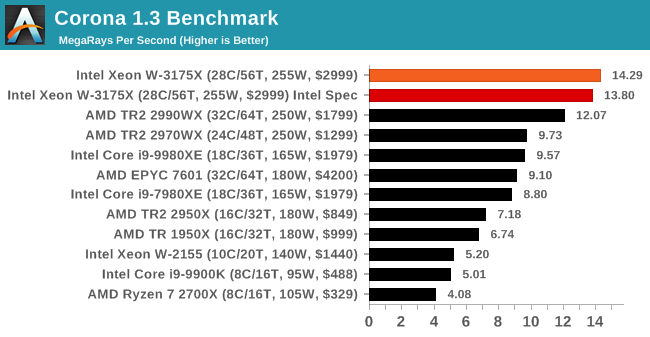 The point here is that the Xeon W-3175X only caters to one market: high performance. 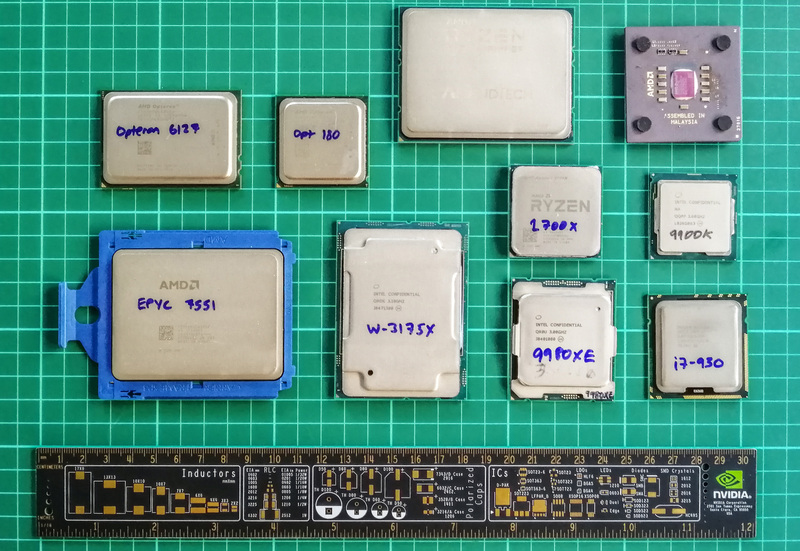 We tested the Xeon W-3175X in our regular suite of tests, and it performs as much as we would expect – it is a 28 core version of the Core i9-9980XE, so in single threaded tests it is about the same, but in raw multi-threaded tests it performs up to 50% better. For rendering, that’s great. For our variable threaded tests, the gains are not as big, from either no gain at all to around 20% or so. This is the nature of increasing threads – at some point, software hits Amdahl’s law of scaling and more threads does nothing. However, for software that isn’t at that point, the W-3175X comes in like a wrecking ball. For our graphs, some of them had two values: a regular value in orange, and one in red called 'Intel Spec'. ASUS offers the option to 'open up' the power and current limits of the chip, so the CPU is still running at the same frequency but is not throttled. Despite Intel saying that they recommend 'Intel Spec', the system they sent to us to test was actually set up with the power limits opened up, and the results they provided for us to compare to internally also correlated with that setting. As a result, we provided both sets results for our CPU tests. For the most part, the 'opened up' results scored better, especially in multithreaded tests, however Intel Spec did excel in memory bound tests. This is likely because in the 'opened up' way, there is no limit to keeping the high turbo which means there could be additional stalls for memory based workloads. In a slower 'Intel Spec' environment, there's plenty of power for the mesh and the memory controllers do deal with requests as they come. Two-and-a-half questions hung over Intel during the announcement and launch of the W-3175X. First one was power, second was overclockability, and two-point-five was availability. On the power side of the equation, again the W-3175X comes in like a wrecking ball, and this baby is on fire. While this chip has a 255W TDP, the turbo max power value is 510W – we don’t hit that at ‘stock’ frequency, which is more around the 300W mark, but we can really crank out the power when we start overclocking. This processor has a regular all-core frequency of 3.8 GHz, with AVX2 at 3.2 GHz and AVX-512 at 2.8 GHz. In our testing, just by adjusting multipliers, we achieved an all-core turbo of 4.4 GHz and an AVX2 turbo of 4.0 GHz, with the systems drawing 520W and 450W respectively. At these frequencies, our CPU was reporting temperatures in excess of 110ºC! 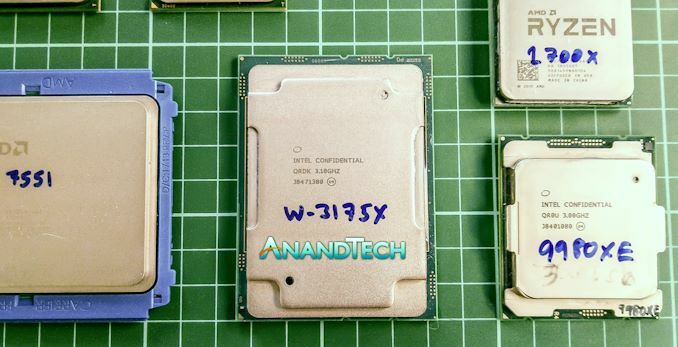 This processor is actually rated with a thermal shutoff at 120ºC, well above the 105ºC we see with regular desktop processors, which shows that perhaps Intel had to bin these chips enough that the high temperature profile was required. On the question of availability, this is where the road is not so clear. Intel is intending only to sell these processors through OEMs and system integrators as part of pre-built systems only, for now. We’ve heard some numbers about how many chips will be made (it’s a low four-digit number), but we can only approximately confirm those numbers given one motherboard vendor also qualified how many boards they were building. According to OEMs we spoke to, initially this processor was going to be $8k. The idea here is that being 28-core and unlocked, Intel did not want to consume its $10k Xeon market. Since then, distributors told us that the latest information they were getting was around $4500, and now Intel is saying that the recommended consumer price is $3000. That’s not Intel’s usual definition of ‘per-1000 units’, that’s the actual end-user price. Intel isn’t even quoting a per-1000 unit price, which just goes to substantiate the numbers we heard about volume. At $8000, this CPU would be dead in the water, only suitable for high-frequency traders who could eat up the cost within a few hours of trading. At $4500, it would be a stretch, given that 18-core on Intel is only $2099, and AMD offers the 32-core 2990WX for $1799 which surpasses the performance per dollar on any rendering task. At $2999, Intel has probably priced this one just right. At $2999, it's not a hideous monstronsity that some worried it would be, but instead becomes a very believeable progression from the Core i9-9980XE. Just don’t ask about the rest of the system, as an OEM is probably looking at a $7k minimum build, or $10k end-user shelf price.